Of course I knew about Christopher Marlowe. I was Outstanding Senior of the Year at Northern Michigan University’s English Department, you know. Poet, playwright, Elizabethan. Sometimes joined with Sir Francis Bacon in authoring Shakespeare’s works. More recently I heard about his more notorious side: homosexual and spy. He came off as a rake to me: clever, devious, daring. That is not what I found in Anthony Burgess’ A Dead Man in Deptford. Yes, he’s a homosexual. Yes, he’s a spy, though he is more of a covert messenger than a spy. 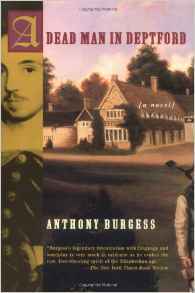 Rather than coming off as a cocky and iconoclastic daredevil, Burgess’s Marlowe is rather earnestly pathetic, or perhaps pathetically earnest. While studying theology at Cambridge, a friend recruits him for Sir Francis Walsingham’s Elizabethan version of MI-5. From the start he begs to be reassured he can quit anytime, and from the start he is told, “Nope. You are in this for life.” On one of his first assignments he is partially responsible for the hanging, drawing, and quartering of some Catholic supporters of Mary Queen of Scots. Forced to watch the execution he is sickened physically and emotionally. His only recompense is that Thomas Walsingham, the spymaster’s kin, is also a spy and also gay and rather into Kit Marlowe for a time. Marlowe’s career from poet to playwright and controversial philosopher runs rather contrary to what appear to be Elizabethan norms and values. This is the Elizabeth of her infatuation or dalliance or flirtation, you choose, with Walter Raleigh and then with the Earl of Essex. She is in her fifties and even less amused than her queenly successor in the 19th century. The Church of England and the Privy Council have teamed up, ostensibly to rid the realm of everyone pernicious to the state church, including Catholics, atheists, witches, other Protestants and even unorthodox C of E. Marlowe is an atheist, though he keeps this as close to his chest as he can, given his obsession to write plays with atheistic and otherwise controversial characterers like Tamburlane. You know from the title and from history that Marlowe was murdered. You have quite a buffet of suspects supplied to you. There are people who would only be too happy to do the knifing, but there are also many others who would pay them to do the knifing. It could be Walsingham’s successor, Cecil or one or more of his operatives. It could be Marlowe’s sometime lover, Thomas Walsingham or, indeed, his devoted servant. It could be Essex. It could even be Raleigh who had invited Marlowe to attend meetings of his free thinking intellectual club. Pretty much from the start you know Marlowe is flinging himself toward disaster. His conflict is primarily how to avoid bringing those he cares about with him. Now I have heard the appellation “Bloody Mary” use to describe Mary I and her supporters and their rapacious burnings of Protestants for the sake of the realm. What I did not know is that we could and probably should refer to her little sister as “Bloody Bess.” Paranoia about Catholic plots, not without foundation, resulted in gory executions too, lots of them, and not just Catholics, but any religious deviant or simple inexpedient enemy of one of the Big Boys and Gal. The French Huguenots, fleeing French religious intolerance, found themselves first the target of rioters and then of the Church and politicians. You could call Marlowe “The Man Who Knew Too Much” and whose knowledge could have messed things up in the constant power struggle and personal greed and ambition. Burgess, of course, does a superb job of the writing. It is in a sort of Elizabethan patois, handled well, sometimes thick, but when necessary laid on thinly. Anyone wanting to write Elizabethan dialogue should read this book. Burgess’s doctoral dissertation was on Marlowe, and it is clear that the historical details are authoritative. I found myself feeling sorry for Marlowe. I know what it is like to push the envelope because one’s convictions won’t melt into the background when writing, not that I claim Marlowe-like talent. In his author’s note, Burgess points out that for all the hopelessness Marlowe may have felt, he is still read and discussed today and enlightens our understanding not only his time but of universal thought.